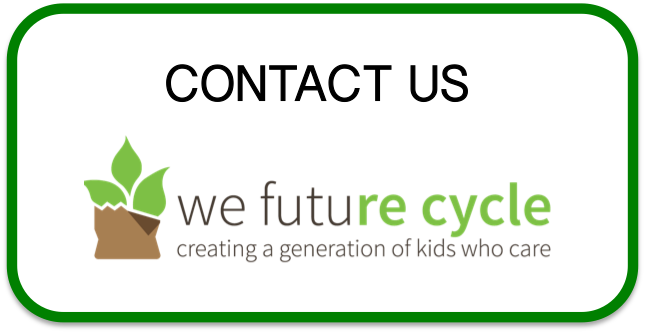 New Rochelle Henry Barnard students are well into their second year participating in the We Future Cycle recycling program. From time to time, we go back into the classrooms to do more education around the topic and even the littlest ones are now sorting flawlessly. They know what goes in the green bin, and what goes in the blue bin. And they are happily piping up when I was “making a sorting mistake”. Teaching children young to care about the environment, to sort materials and foster the understanding that nothing is disposable is the key to creating a generation of kids that care. Barnard’s students are leading the way! White Plains Church St Elementary Students are coming full circle. We Future Cycle just did a planting project with 4th grade using the schools own compost. While recycling and placing their food waste into compost is now second nature to the students, the connection to what happens to that food waste and how it is used had not really been made. Last spring, We Future Cycle implemented the second step of the program, which is tackling the classroom snack trash. Students are learning that food waste is not trash, but a valuable resource. Part of that program is to feed the apple cores and banana peels from snack also to compost. Last spring and this fall, students collected the organic snack waste in a little pail, brought it outside to the court yard and placed it into the composter, and now ….we got to harvest our first compost, going full circle. We Future Cycle’s “Science of Compost” workshop explains the science behind food waste decomposition as well as its connection to healthy soils. Students got to examine closely different soil samples and make observation as to the fertility, ability to tilth, water retention and content of organic matter. We then planted seeds in normal garden soil, versus garden soil amended with their own compost. And now students are conducting scientific observation.